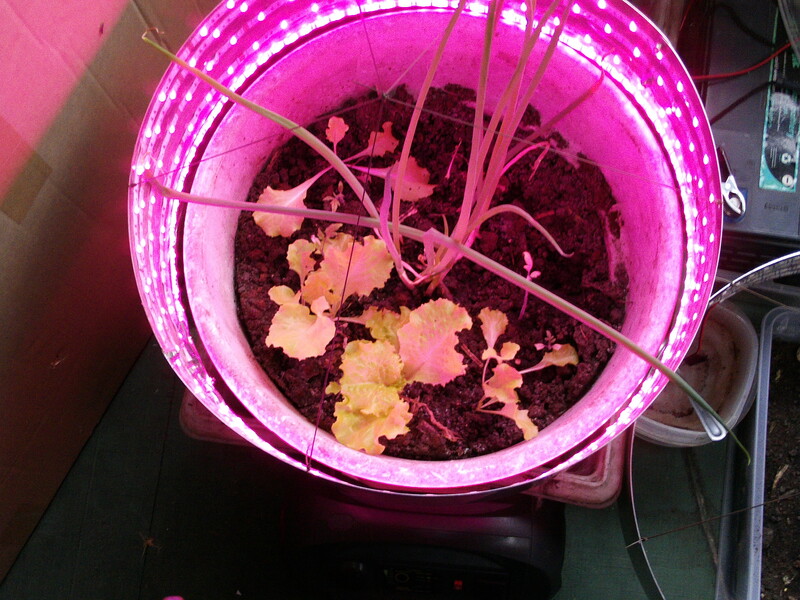 Another week has gone by and results are good. 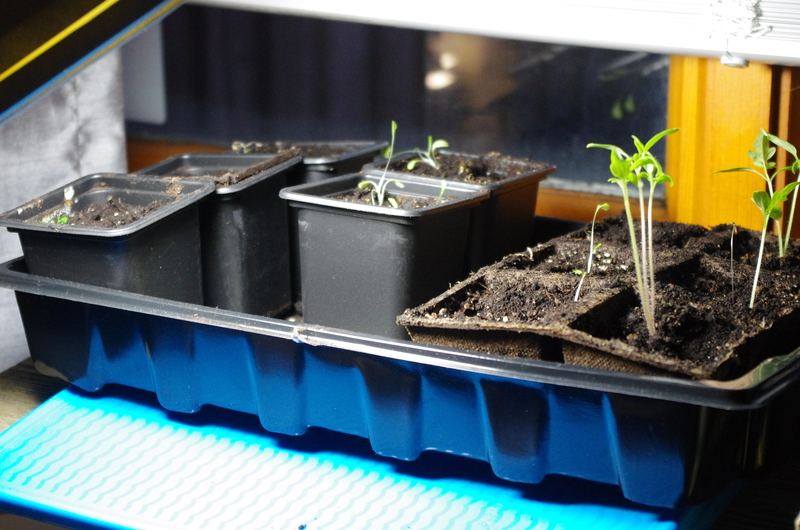 The plastic cover helps to create it’s own environment keeping everything nice and warm with the room temperature at 48 degrees F. Even the tomato plant at the back is jumping up since last week. 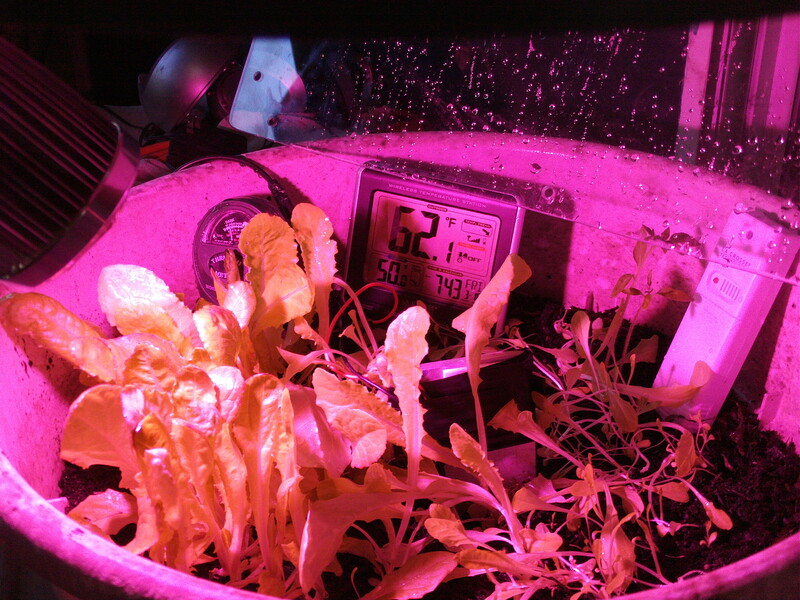 Also you can see that the grow light is having a good influence as well. Transplanting to outside and another planter to give space is still delayed due to frost at night. The same group of transplanted lettuce in my tray is only 1 1/2 inches high and spindly. 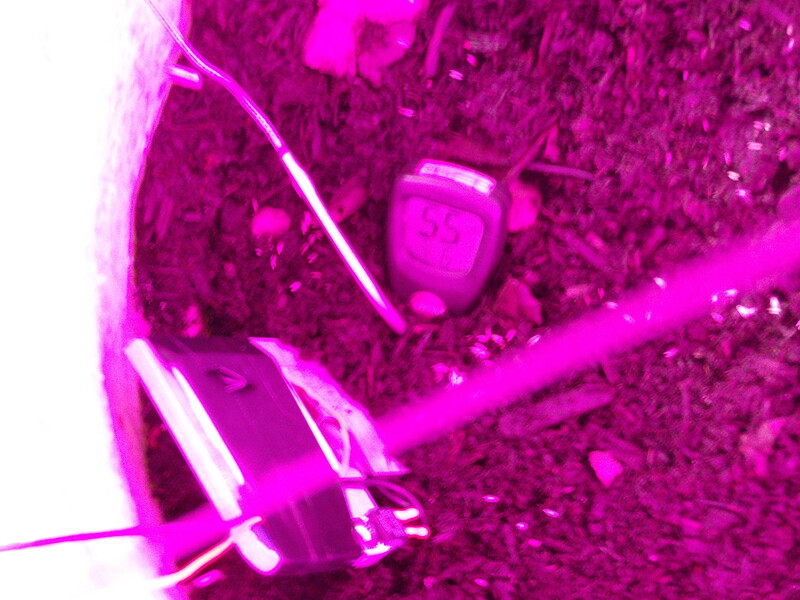 Room at 70F. 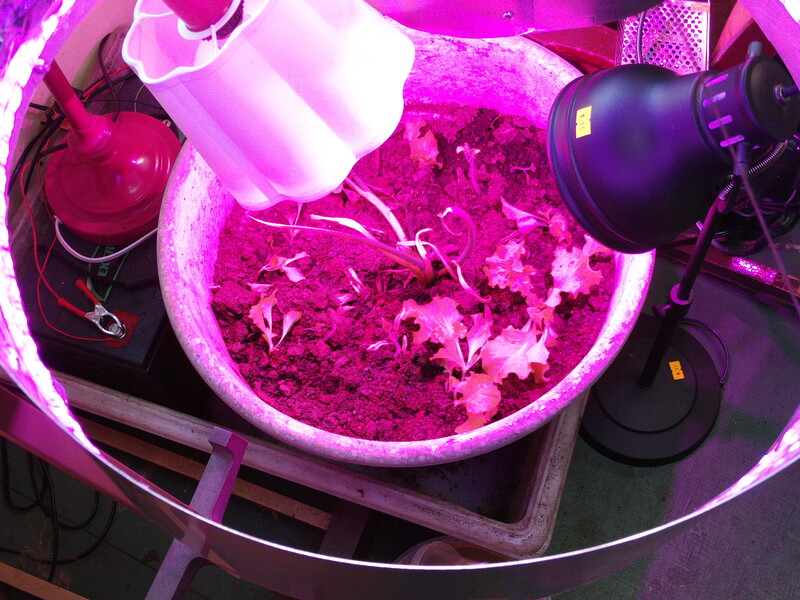 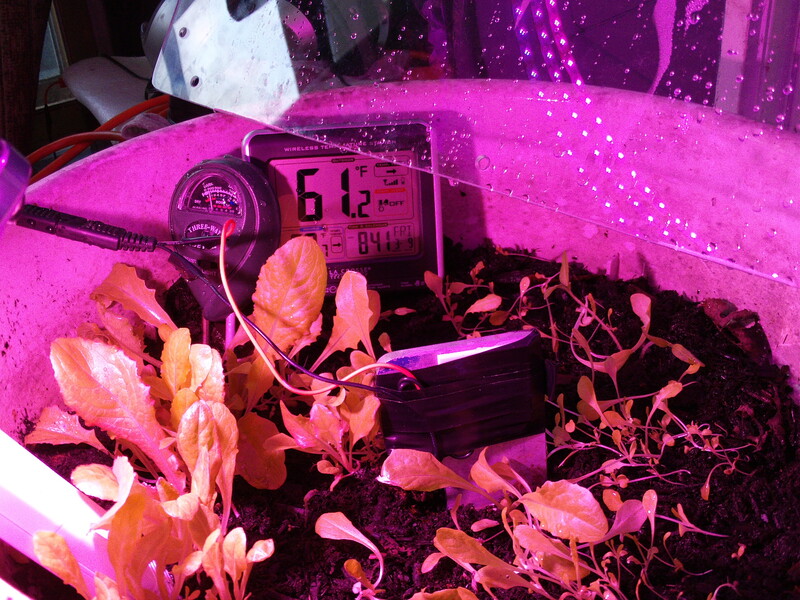 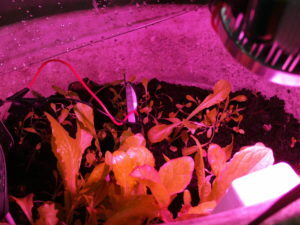 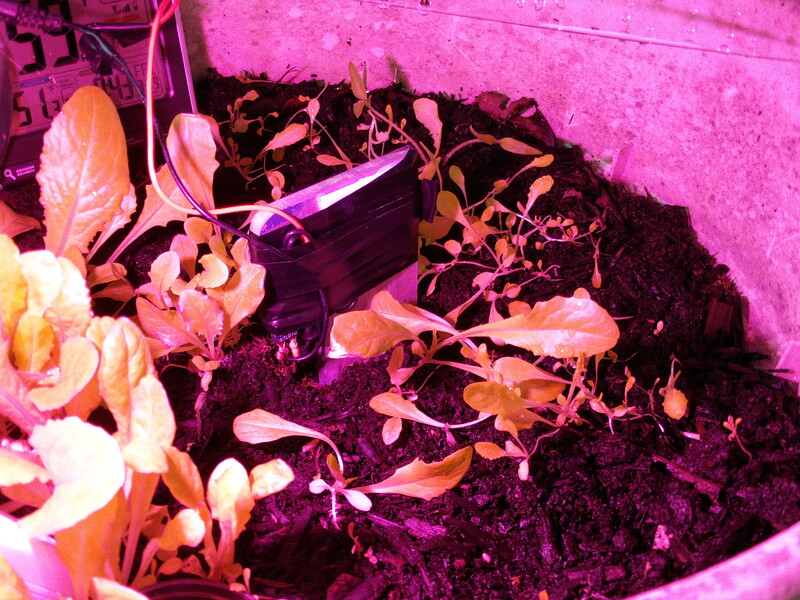 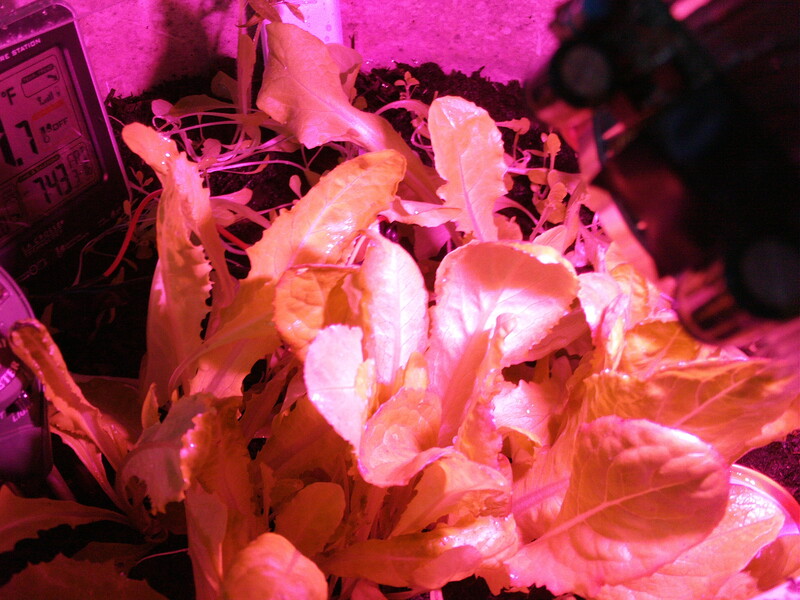 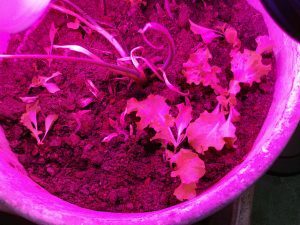 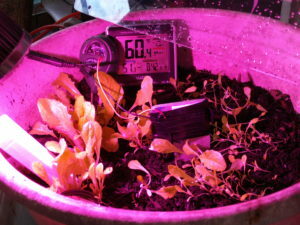 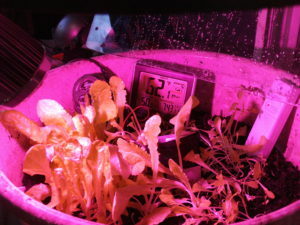 As can be seen, moving the heater to the center of the pot has helped to accelerate the growth of the lettuces near the heater. 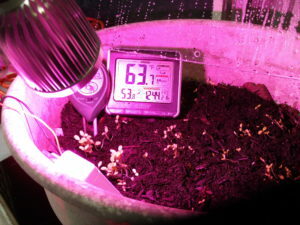 At the far side of the pot the plants are coming along at what would be a normal rate. 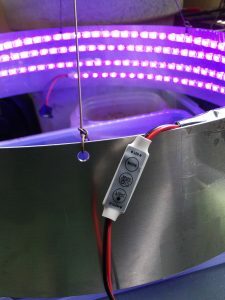 Also the first heated plants are close to the 20 watt grow light with the 30 watt grow ring light over all of the plants.Once the outdoor temperature stay above freezing the plants will be transferred outdoors. 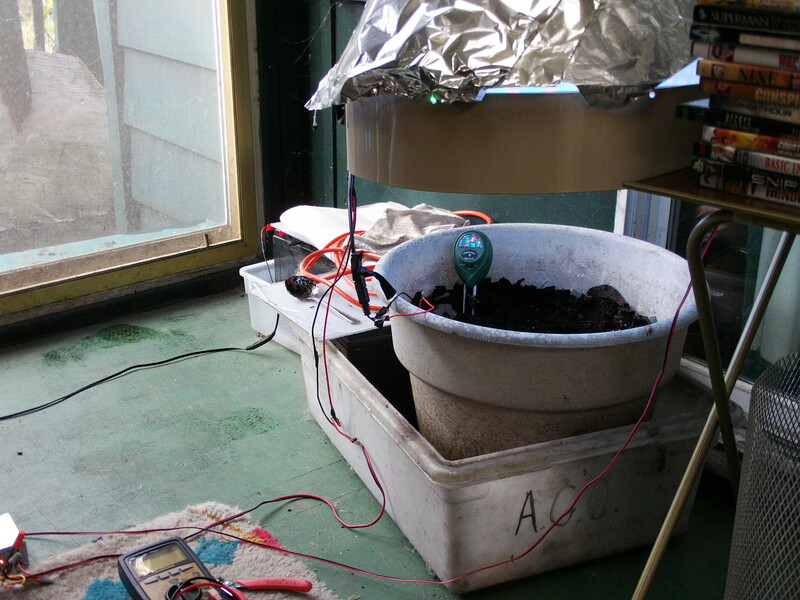 This will bring the experiment to an end as the results are positive. 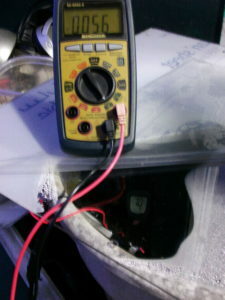 The heating element was repositioned to the center of the pot. 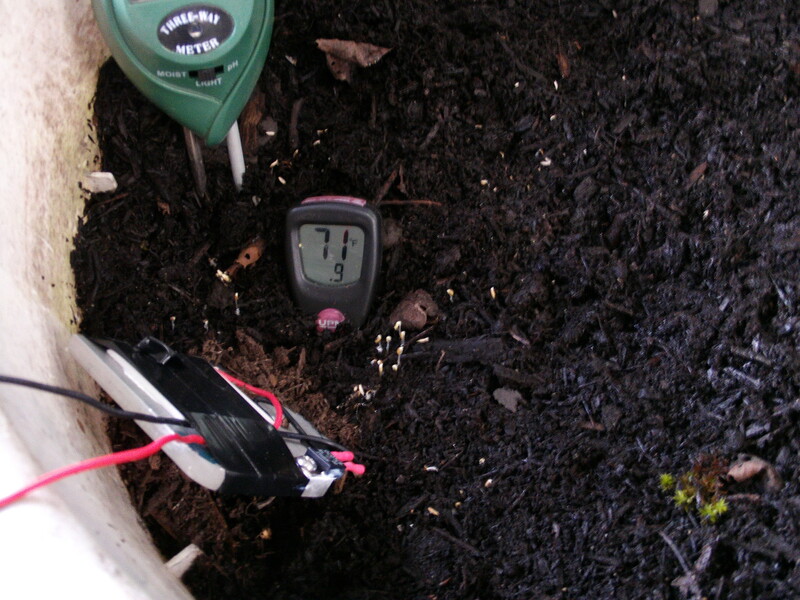 It is observed that the heating of the ground did strongly affect the plants in the warmer area. This next test should help the plants near the center of the pot to catch up to the ones near the original mounting position. 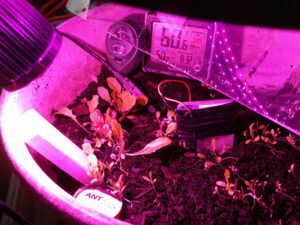 The larger grow light was also turned down to even out the lighting available. 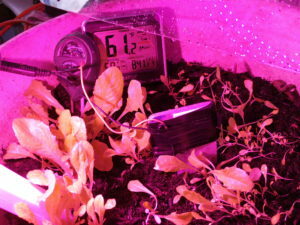 The plants are 2 weeks today. Room temperature is 56 degrees and 68 degrees at the pot. It is based on a video I saw about tree lines on mountains and ground temperature. 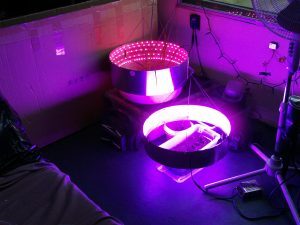 Last year my plants under the grow lights did not do as well as I had hoped, probably due to the fact they were in my unheated back room, so I thought what if I bring the ground temperature up using a Peltier device? 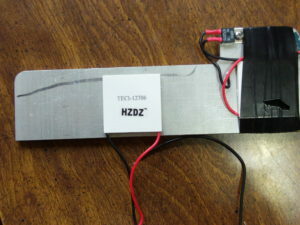 Cheap, 50 to 70 watts for less then $5 from DX. 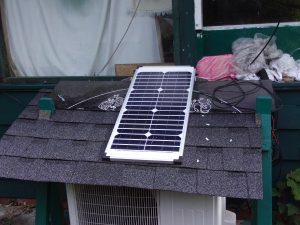 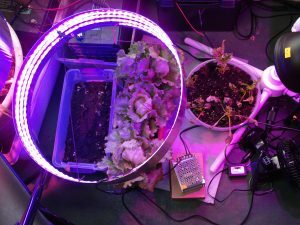 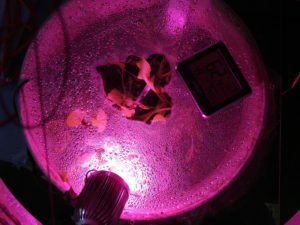 Using the already set up solar system for powering the LED grow lights a sort of terrarium, the device was taped to an aluminum stake with a thermal cut off at 70 degrees Celsius. Then inserted into the dirt at a slight angle and lettuce seeds were sprinkled around. 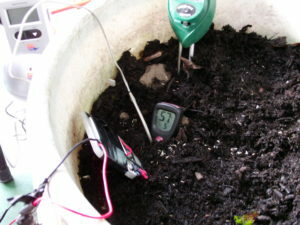 The unit then ran over night with a room temperature of 58 degrees and the surface dirt temp of 70 to 72 degrees F.
Also note the Lexan cover I had on top of the pot overnight has lots of condensation except were the cooling side of the device is located. 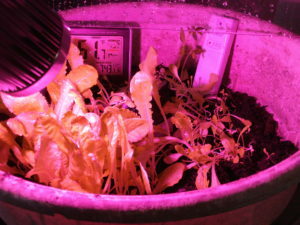 The lettuce started to grow in about 2-3 days, even though I was using old seeds. We’ve successfully developed food grow lights and they will be available for sale soon. Please, send your inquiries.